Summary: An international team of researchers have created remote controlled nanobots from a biodegradable material that they believe could assist doctors in diagnosing diseases and delivering drugs to target sites. A team of scientists have created a new generation of tiny remote controlled nanorobots which could one day allow doctors to diagnose disease and deliver drugs from within the human body. The team led by Professor Li Zhang from the Chinese University of Hong Kong, including Professor Kostas Kostarelos from The University of Manchester, have created the bots from a biodegradable material called spirulina algae. The algae, sold today as a food substitute in health food shops, was a source of nourishment during the time of the Aztecs. But it was rediscovered in the 1960s by Lake Texcoco in Mexico by French researchers. A paper by the team, published in Science Robotics hails the bots’ biodegradability as a new concept, in which an iron magnetic coating helps fine-tune the rate which they degrade. The nanorobots can be remotely controlled within complex biological fluids with high precision using magnetic fields. The team also describes how the bots are able to release potent drug compounds that are able to attack cancer cells. However more work still needs to be done on motion tracking, biocompatibility, biodegradation, and diagnostic and therapeutic effects before clinical trials can take place. Professor Zhang said: “Rather than fabricate a functional microrobot from scratch using intricate laboratory techniques and processes, we set out to directly engineer smart materials in nature, which are endowed with favorable functionalities for medical applications owing to their intrinsic chemical composition. For instance, because these biohybrid bots have a naturally fluorescent biological interior and magnetic iron-oxide exterior, we can track and actuate a swarm of those agents inside the body quite easily using fluorescence imaging and magnetic resonance imaging. 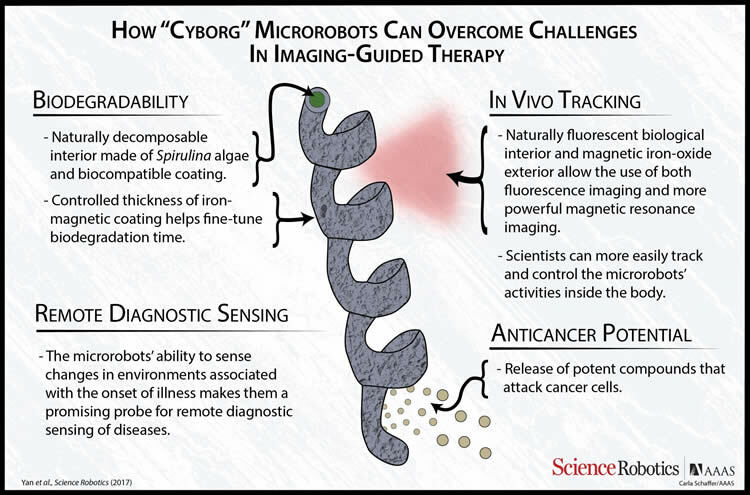 “Our microrobots have the ability to sense changes in environments associated with the onset of illness and that makes them a promising probe for remote diagnostic sensing of diseases. Professor Kostarelos said: “Creating robotic systems which can be propelled and guided in the body has been and still is a holy-grail in the field of delivery system engineering. “Our work takes advantage of some elements offered by nature such as fluorescence, degradability, shape. “But we add engineered features such as magnetisation and biological activity to come up with a the proof-of-concept behind our bio-hybrid, magnetically propelled microrobots. The nanorobots can be remotely controlled within complex biological fluids with high precision using magnetic fields. NeuroscienceNews.com image is credited to Yan et al./Science Robotics. He added: “We are still in early days of development since any such robotic system would need to be either completely and safely degraded, or it will need to be removed or excreted from the body after it has finished its work. “But nevertheless, our work provides the first ever example of how this could be possibly achieved by degradation. The research teram included the Chinese University of Hong Kong, The University of Edinburgh and The University of Manchester. Image Source: NeuroscienceNews.com image is credited to Yan et al./Science Robotics. University of Manchester “Nanobots Pass First Stage in “Fantastic Voyage” From Fiction to Fact.” NeuroscienceNews. NeuroscienceNews, 25 November 2017. University of Manchester “Nanobots Pass First Stage in “Fantastic Voyage” From Fiction to Fact.” http://neurosciencenews.com/nanobots-health-8028/ (accessed November 25, 2017). Magnetic microrobots and nanorobots can be remotely controlled to propel in complex biological fluids with high precision by using magnetic fields. Their potential for controlled navigation in hard-to-reach cavities of the human body makes them promising miniaturized robotic tools to diagnose and treat diseases in a minimally invasive manner. However, critical issues, such as motion tracking, biocompatibility, biodegradation, and diagnostic/therapeutic effects, need to be resolved to allow preclinical in vivo development and clinical trials. We report biohybrid magnetic robots endowed with multifunctional capabilities by integrating desired structural and functional attributes from a biological matrix and an engineered coating. Helical microswimmers were fabricated from Spirulina microalgae via a facile dip-coating process in magnetite (Fe3O4) suspensions, superparamagnetic, and equipped with robust navigation capability in various biofluids. The innate properties of the microalgae allowed in vivo fluorescence imaging and remote diagnostic sensing without the need for any surface modification. Furthermore, in vivo magnetic resonance imaging tracked a swarm of microswimmers inside rodent stomachs, a deep organ where fluorescence-based imaging ceased to work because of its penetration limitation. Meanwhile, the microswimmers were able to degrade and exhibited selective cytotoxicity to cancer cell lines, subject to the thickness of the Fe3O4 coating, which could be tailored via the dip-coating process. The biohybrid microrobots reported herein represent a microrobotic platform that could be further developed for in vivo imaging–guided therapy and a proof of concept for the engineering of multifunctional microrobotic and nanorobotic devices.